This guide to teaching writing and to major theoretical issues—including current central concerns of rhetoric and composition—contains a brief anthology of scholarly essays and coverage of constructing successful assignments using visual, oral, and electronic texts; teaching multilingual writers; and using technology in the writing classroom. This new edition includes additional practical advice for dealing with classroom issues and helpful guidance for sequencing assignments, teaching revision, using online peer review, and working toward student transference of knowledge and skills. *Douglas Downs and Elizabeth Wardle, Teaching about Writing, Righting Misconceptions: (Re)Envisioning "First-Year Composition" as "Introduction to Writing Studies"
Cheryl Glenn is Liberal Arts Research Professor of English and Women’s Studies at the Pennsylvania State University. Before moving to Penn State, she taught at Oregon State University, where she earned a number of research and teaching awards and established the Center for Teaching Excellence. She also teaches at the Bread Loaf School of English, a summer graduate program for secondary teachers held in Vermont and New Mexico. Glenn’s scholarly work focuses on contexts and processes for the teaching of writing, histories of women’s rhetorics and writing practices, and inclusionary rhetorical practices and theories. Her many scholarly publications include Rhetoric Retold: Regendering the Tradition from Antiquity Through the Renaissance; Unspoken: A Rhetoric of Silence; Rhetorical Education in America; The St. Martin’s Guide to Teaching Writing; The Writer’s Harbrace Handbook; Making Sense: A Real-World Rhetorical Reader; and The Harbrace Guide for College Writers. She and J. Michael Hogan coedit Rhetoric and Democratic Deliberation, a Pennsylvania State University Press series. With Shirley Wilson Logan, she coedits the Southern Illinois University Press series, Studies in Rhetorics and Feminisms. 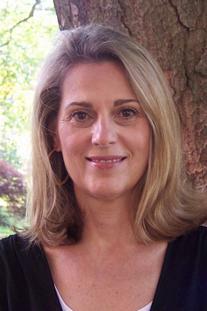 Glenn’s rhetorical scholarship has earned her three fellowships from the National Endowment for the Humanities (NEH), book awards from Choice and from the Society for the Study of Early Modern Women, a Best Article of the Year Award from College Composition and Communication, and an Outstanding Article Award from Rhetoric Review. She also has won four teaching awards. She has recently served as Chair of the Conference on College Composition and Communication (CCCC), and also serves in a variety of other leadership roles at Penn State and for the National Council of Teachers of English, the Coalition of Women Scholars in the History of Rhetoric and Composition, the Modern Language Association, the Rhetoric Society of America, and NEH. 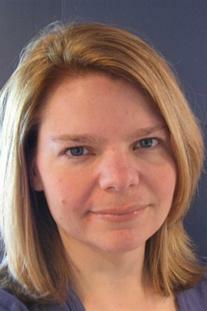 Melissa A. Goldthwaite teaches rhetorical theory, composition, and creative writing (poetry writing, creative nonfiction, food writing, and nature writing) at Saint Joseph’s University, where she is Professor of English. For Bedford/St. 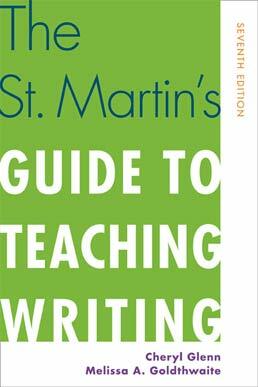 Martin’s she is co-author with Cheryl Glenn of The St. Martin’s Guide to Teaching Writing. Her work has appeared in College English, Writing on the Edge, Reader, and in numerous books.